+ Kollagen Intensiv has undergone clinical study and trial at Pentapharm in Basel, Switzerland, hence the German-sounding product name. The studies behind Kollagen Instensiv affirm an acceleration of natural collagen production on a cellular level in 84 days, as well as a reduction of wrinkles by up to 354%. + Kollagen Intensiv claims are that it is safe for all skin types. Although, the FDA may not have given Kollagen Intensiv an unadulterated approval as of yet, much less an evaluation of any sort, we can only suppose that the premise behind such a claim is that the ingredients found in the product are relatively universal and used in skin care products worldwide. + Meanwhile, the contents of the product appear to be safe, natural-occurring, and nontoxic. Hyaluronic acid, shea butter, and glycerin are just some of its major components. Kollagen Intensiv also has various sorts of vitamins and herb extracts that have their own purpose. We will take a closer look at Kollagen Intensiv’s ingredients down below. + The product also claims to be a more economical option to skin care as opposed to cosmetic enhancement procedures, such as collagen injection, and products. In terms of product consumption, Kollagen Intensiv is a bargain. 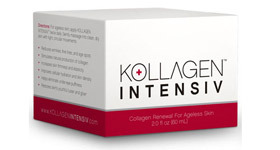 The ingredients of Kollagen Intensiv, work altogether fight the process of aging effectively and efficiently, at the same time by stimulating collagen, skin repair, skin regeneration, sun protection, hydration, and moisture retention, eliminating the need for various skin care products. - We know that no product is perfect. We believe every product must undergo censure, even Kollagen Intensiv. Cost is a vital factor when making a purchase and this product fails to impress. Kollagen Intensiv is an expensive skin care product as compared to other collagen-boosting products available in the market. - Then again, we also question what the basis for the claim of accelerated natural collagen production in 84 days is; add the fact that the product has not been evaluated by the FDA. Also, the Return Policy is faulty. In relation to the 84 day-campaign, the validity return is only within 97 days from delivery date, which is illogical, given the product takes 84 days before one can witness results. Collagen is the body’s naturally occurring protein that has proven to be of value to the cosmetic industry due to its reparative and regenerative qualities to the skin. Collagen is widely used in both aspects of cosmetic enhancement and surgery. In particular, collagen has been studied to respond to skin aging concerns such as wrinkles and fine lines. The stimulation of collagen in improving overall skin texture is neither a modern nor ground-breaking discovery. Collagen stimulation is the main principle behind addressing skin problems and developing machines and procedures for skin care and cosmetic enhancement such as lasers and peels. As stated in their disclaimer, Kollagen Intensiv’s product claims have not been evaluated by the Food and Drug Administration. Neither does the product claim to treat, cure, or prevent any disease. However, we find that the ingredients in Kollagen Intensiv are used profusely and ubiquitously in many skin care products. The ingredients used are relatively safe for mass consumption, whatever the skin type. Using the same rationale, we find that Kollagen Intensiv is not significantly different from other collagen-boosting products. In fact, with the price tag on Kollagen Intensiv, we can thus say that there are better known collagen-boosting products in the market sans the hefty price tag of $101. All products have claims. Some product claims are proper and true, while some are not. New products especially promise a whole lot more. Thus, we question the validity of the many claims from the manufacturer of Kollagen Intensiv, in particular the scientific claims. The scientific data Kollagen Intensiv presents in their ad campaign are not clearly explained. Their product claims of wrinkle reduction and collagen production poses questions such as how they came up with the figure of 354% wrinkle reduction, and how is wrinkle reduction measured or quantified. The lack of an FDA approval is definitely to the product’s disadvantage in relation to proving these claims. We believe such deficiency is definitely never good for a business in the skin care arena, as the lack of evaluation from a reputed and vital agency results to a tedious decision-making process for the consumer. Still, a glance at the products review would have the consumer know that the products used, by themselves, are approved by the FDA. Hyaluronic acid, for instance, is approved by the FDA in the procedure called as Hyaluron Injection, which is a non-surgical cosmetic enhancement procedure that targets soft-tissue defects, such as wrinkles. On the other hand, its other ingredients like SYN-COLL would have been best presented with an introduction, if not an explanation. The multi-faceted quality of Kollagen Intensiv is another such of the manufacturer’s claims, and need yet to be seen and proven. The cream claims to rid of the need for a manifold of skin care products such as eye creams, day creams, and night creams. Such a class of product would mean savings in thousands of dollars from cosmetic enhancement procedures and skin care products. Still in question is the degree of protection from the UV rays it provides, considering that this product contains ingredients with smoothening and lightening effects would mean a degree of peeling occurs. There was no such direct contention of “lightening”, but other commerce sites where it is sold re-brand it to reduce age spots, which are pigmentation that occurs on aging skin. Therefore, if such claim of reducing age spots is true, we can and should not undermine a proper defense against the sun and should supplement use of this product with additional sun protection. We believe Kollagen Intensiv works through its ingredients starting with the most vital ingredient called the SYN-COLL which enables the body’s production of collagen, while also aiding in reversing damages caused by UV radiation. Also, hyaluronic acid, an FDA-approved ingredient common in skin care products, works by managing wrinkles. Cyclopentasiloxane is used for the disappearance of fine lines. Glycerin, on the other hand, is also a crucial ingredient because of its function in making the skin stronger and resistant. To nurture the skin, Kollagen Intensiv has added shea butter to smoothen and soften. Shea butter also keeps your skin hydrated and moisturized. To rejuvenate the skin are vitamins, trace minerals, anti-oxidants, essential oils, peptides, fatty acids, and enzymes. These collagen-stimulating and skin rejuvenating ingredients together prevent the effects of glycation, which cause the weakening of collagen. Kollagen Intensiv is believed to work on all skin types. 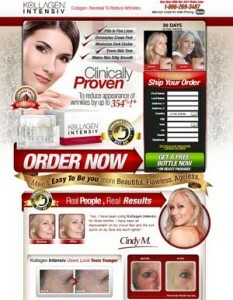 We recommend to buy Kollagen Intensiv ONLY from their official website shop (follow this link www.kollagenintensiv.com). However, it is also sold in many commerce sites such as Ebay and Amazon. From the flagship website, the cream is sold in 90-day packages of 3 boxes for the price of $101. We urge you to not to sign up for the free trial on any website. These often sign your credit card up for monthly payments which are near impossible to cancel. Customers who have purchased and used Kollagen Intensiv hardly have any negative reviews about the effectiveness of the product, so long as they purchase the authentic one. Costumers are pleased with the product as a multi-tasking cream. Customer reviews say that the cream is gentle and non-greasy, and has a nice floral smell. After use, consumers report that their skin look and feel better. Although, the product only “appears” to work, as users say with a degree of uncertainty. The 84-day results did not occur in most customers. Meanwhile, there also were users of the product that experienced allergic reaction such as break outs to an ingredient or ingredients of Kollagen Intensiv. We observed that most people who bought Kollagen Intensiv researched the product themselves before purchasing. We find that cost seemed a major factor in a customer’s delayed and laborious purchase decision. Also, some purchases done over Amazon have resulted to unsatisfactory transactions, as some customers got a fake product. We think this is something individuals thinking about buying Kollagen Intensiv should be very aware of. Kollagen Intensiv regenerates skin and reduces fine lines and wrinkles through its collagen-stimulating ingredients, add the natural ingredients that reverse the skin’s aging process, all the while keeping your skin hydrated and moisturized. All of these actions combined help reduce fine lines and wrinkles. One of the other claims of Kollagen Intensiv is that it works on all skin types. On the other hand, skin reactions may vary across individuals. Allergic reactions have been a complaint. Thus, for people with sensitive skin or skin that react to certain allergens, it is best to be familiar with the ingredients before making a purchase. Some clients of Kollagen Intensiv relate that refunds were not allowed for allergic reactions to the product. Skin care products should always be viewed with a critical eye, with special mention to new ones on the market. If anything, we believe that longevity of a product or company reveals significant information to its quality and effectiveness. Many skin care manufacturers have been in the market for more than one hundred years, and this is no easy job. New ones on the other hand, need to seriously prove themselves, and if possible, back themselves properly, especially with an FDA approval, apart from scientific studies. 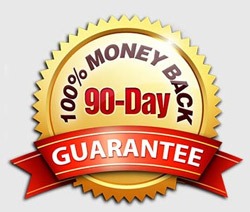 If you are not satisfied with the product, Kollagen Intensiv offers a full refund for the 90-day kit (3 boxes), excluding shipping charges, this is possible within a 97-day period that begins from the time of delivery. The Terms and Condition include that whilst the customer is free to purchase multiple boxes at a time, refunds are limited only to one order per customer, which seems a bit complicated. We find that Kollagen Intensiv is a legitimate product with an ingenious selection of ingredients that, for many, actually work. However, the product claims may tend to be amplified beyond what the product can actually do. Consumers should be wary of Kollagen Intensiv’s claims, but, more importantly its free trial scheme. Should you avail of the free trial product and don’t like it, make sure to cancel it the soonest possible time to avoid unnecessary packages from Kollagen Intensiv and charges. Which other product offers similar or the same, at better prices?